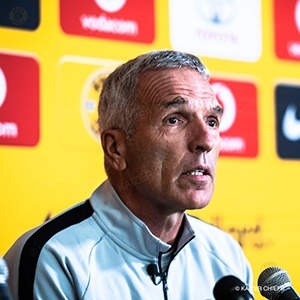 Cape Town - Kaizer Chiefs head coach Ernst Middendorp has once again alluded to the fact that there are a number of players within his squad he is unhappy with. Middendorp has done a good job of getting the club back on track after the disastrous reign of Giovanni Solinas last year and now he is looking at shedding some unwanted fat from the playing ranks. "We should have four or five points more than what we currently have. We threw points away. At the moment, we can't think too far ahead. The team has reacted well. The players are motivated, and we will challenge for whatever is in front of us," Middendorp said. "We are capable of achieving. At the moment we are not 100% happy with some players, it's not a secret. We have to look at how far we can go next season. But that's a normal process. "Attitude is very important for each and everybody. You must have the right attitude each and every day. If you come to the training session and do a little bit on Monday, push yourself on Tuesday and Wednesday, and Thursday you just roll your fingers... what do you want with that type of player?" However, the in-from Hendrick "Pule" Ekstein is one player he definitely does not want to see the back of, despite the on-going drawn-out contact battle between the player and the club. "I have said it several times, Pule is one of the best players I have worked with," Middendorp added. "I will say it again. There's a bit irritation at the moment. I told him 'I hope you stay. I hope you work with us'. He knows where I stand."